Radha Kunda's Appearance Day - Nov 3, 2015 ~ The Toronto Hare Krishna Temple! Tuesday, November 3, 2015 marks a special festival, Radha-Kunda's Appearance Day. 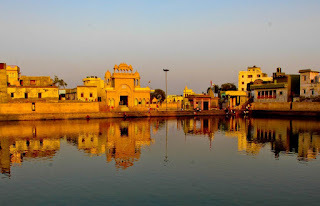 Radha-Kunda is a pond near Govardhan Hill in Vrindavan, India, which was originally created by Krishna's cowherd girlfriends, the gopis, during Krishna's boyhood pastimes in Vrindavan. In the sixteenth century, it was rediscovered by Chaitanya Mahaprabhu, and renovated by Mahaprabhu's disciples, the Six Goswamis. Many sacred texts, including the Puranas, Srimad-Bhagavatam, Upadeshamrita, and Chaitanya-charitamrita say that Radha-kunda is one of the most significant places of pilgrimage on earth. Celebrations will be taking place at the Hare Krishna Temple on Tuesday, November 3, 2015 from 6:00pm to 9:00pm. The festival will be a small and intimate gathering and everyone is welcome to join! On a field near Govardhana Hill, in the twilight, the demon Arishtasura had assumed the form of a bull and, at King Kamsa’s order, had tried to kill Lord Krishna. Instead, the Lord had slain him. Just prior to his attack, Krishna had been chatting with His girlfriends, the gopis of Vrindavana, who had become quite frightened by the demon’s angry bellowing. Krishna strolled over to them, expecting to engage in their usual rasa dance. In this, the girls would form a circle, Krishna would miraculously reproduce His body between each two girls, and the party would ecstatically dance round and round. But the gopis, now relieved of their fear of Arishtasura, were in a playful, joking mood. “I have?” Krishna beamed, playing along with their joke. “You should atone for Your sin,” a third gopi said. “Atone?” He asked, eyebrows raised. They all nodded firmly, wanting to laugh but restraining themselves. “All the rivers?” Krishna asked. “How can You do that?” asked the second gopi skeptically. Krishna turned away from them and kicked His heel into the ground, making a hole. In a few seconds, the personified forms of every sacred river appeared there, standing with their palms folded and heads bowed. The men were bare-chested but decked in rich dhotis, whereas the women were wearing luxurious saris. Krishna turned to the gopis. Each river spoke his or her name, such as Ganga, Yamuna, Saraswati, Sarayu, Sona, and Sindhu. The gopis looked at each other doubtfully. Were those persons really those rivers? Then the hole that Krishna had made with His heel suddenly expanded into a vast hollow, and all the personified rivers gladly entered it, each manifesting his or her own water form. It was now a beautiful, inviting, holy pond. Krishna descended and splashed into it up to His neck, dunked His head several times, and climbed out, drying His dark glistening body with His hands. The girls tittered, knowing they never had to anyway. “But look at you,” Krishna said with mock condescension, pointing at them. “What about us?” a few asked. “How?” the third gopi asked. “But where?” asked the second gopi. With Krishna in tow, Radharani confidently led Her friends a short distance away. They noticed that Arishtasura’s hooves had dug a shallow ditch just west of Krishna’s pond, and Radharani decided to make Her pond there. “Let’s start digging,” She said to Her friends. They bent over, began clutching clumps of soft clay, and discarded them. After only an hour, they created a large hollow. Krishna was astonished by how rapidly they had dug it. “Your pond?” Radharani asked, patronizingly. Krishna recalled that some time ago He had meditated on the holy Ganges River, which was a considerable distance from Vrindavana, and had miraculously made it appear here as a lake. It was thus named Manasi Ganga (“the Ganges created by Krishna’s mind”). But now Krishna wanted to spare Radharani and Her friends the heavy labor of lugging thousands of jugs of water from there to here. So He gestured to His pond, and suddenly a male representative of all the holy rivers emerged from it. With tears in his eyes, he folded his palms, bowed his head to the ground before Radharani, and devotedly prayed to Her. Radharani’s mood changed from playful to serious. She could see that he was approaching Her for some sacred purpose. Radharani gratefully glanced at Krishna, and then returned Her attention to the rivers’ representative. Her friends nodded in agreement, feeling immensely happy. At that moment, all the holy rivers in Krishna’s pond broke through its blackish clay boundary and quickly flowed into and filled Radharani’s pond. This movement sounded like a surging river during a heavy rainstorm. As the darkness enfolded them, Krishna and the gopis formed a circle and began their rasa dance. He resembled a rain cloud, and Radharani a flash of lightning. As They danced, They generated a torrential downpour of brilliant, transcendental joy. From that night on, Radharani’s pond (kunda) would be called Radha Kunda, and Krishna’s, Shyama Kunda. And anyone who would bathe even once in Her pond, or perform devotional service on its banks, would, by Her mercy, develop pure love for Krishna. Such love would of course culminate in continuous divine ecstasy. Thus, Radha Kunda would become known as the most exalted pilgrimage spot in the world. For this reason, countless pilgrims travel many miles just to bathe in its spiritually exalting waters.